In the fifties or sixties these kits were sold by the US company Tandy. The kit includes the precut set (with numbered strands for easy braiding! ), wooden handle w/ rolled core, small parts and a detailed instruction. 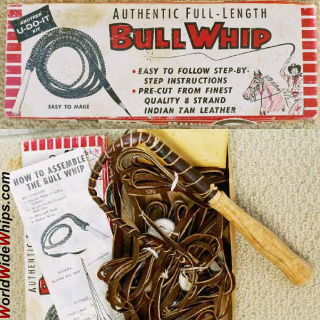 The owner had to braid the whip beginning from the point, from 4plt up to 8 plt. Remarkeable: the kit contains no popper. The instruction in fact mixes it up with the fall. The same kit existed with a Tandy label instead of the "U-DO-IT" logo. As a document of its time, I will let it remain unassembled.